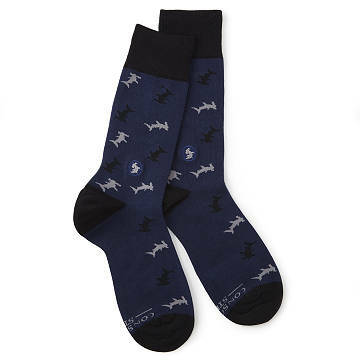 Support Oceana’s work maintaining shark populations with these hammerhead-printed socks. We're gonna need a bigger sock drawer. Okay, sorry, get that image of Jaws out of your head—it's the sharks that need saving this time. This hammerhead-printed pair supports the work of an important organization called Oceana, which works tirelessly to save the shark populations in our oceans and to fight back against the fin trade. Sharks are incredibly important when it comes to maintaining our ocean ecosystems—and we can all have a hand (er, foot in protecting them. Feel extra good about the fact that this pair is made from organic cotton via an ethical supply chain. Made ethically in India with organic cotton.